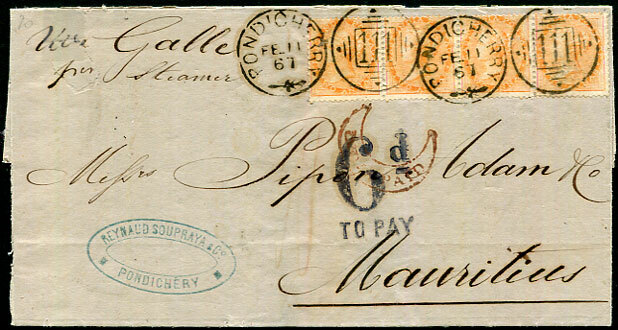 1867 REYNAUD SOUPRAYA & Co, PONDICHERY sender cachet entire with strip of four QV 2a orange pmk'd PONDICHERRY "111" duplex dated FE 11 67 to Piper Adam & Co, Mauritius backstamped Madras transit and 2/MR 2 67 arrival, address panel with handstruck "6d TO PAY" in black. Exhibition item. 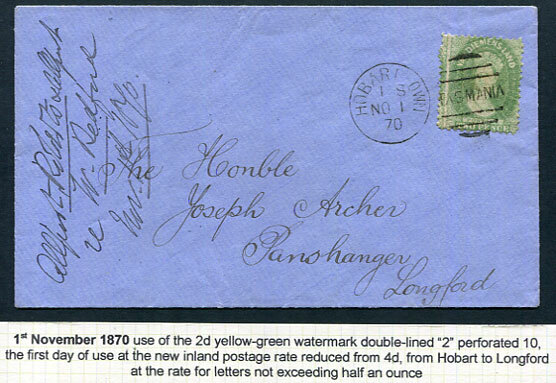 1870 FIRST DAY OF ISSUE OF SIDEFACE with new rate paid by Chalon 2d yellow-green pmk'd Hobart Town NO 1 70 to The Hon. Joseph Archer, Panshanger, Longford. Ex CHARTWELL collection. APS (1994) Certificate. This adhesive had short duration, compounded by survival, adding to rarity. 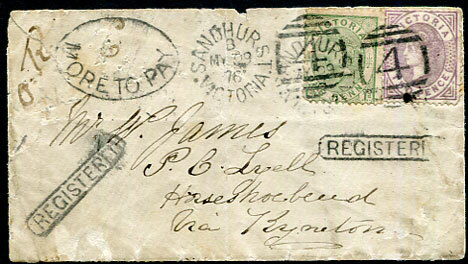 1876 interrupted mail cover to Horse Shoe Bend with QV 1d, 2d pmk'd Sandhurst "4" duplex dated B/MY 29 76. Marked in manuscript "O.R." (Officially Registered) as it contained something of value contrary to law with two strikes framed REGISTERED and oval MORE TO PAY appended "6d" in matching ink. Some faults, soiling and backstamped Redesdale Victoria MY 30 76 clear of missing flap. RPSV Certificate (2008). The expectation is that the survival rate of Officially Registered covers, because they contained coin or other valuables, for the pre-1885 adhesive period is approximately 1 within every 10,000. This means that most countries can offer no examples. For the whole of the British West Indies group I record only one cover which was compulsorily registered. 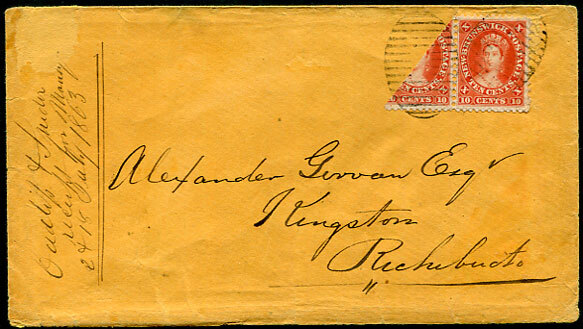 1863 treble rate local cover with exceptionally rare QV 10c red bisected diagonally in se-tenant pair with whole stamp (SG.17) tied by mute grids on orange envelope to Richibucto, flap torn on opening, backstamped weak red KINGSTON and clearer black SHEDIAC both dated JY 20 1863. Ex DALE LICHTENSTEIN (Nov/1868) and CARTIER (Sept/1977 realised £1300). 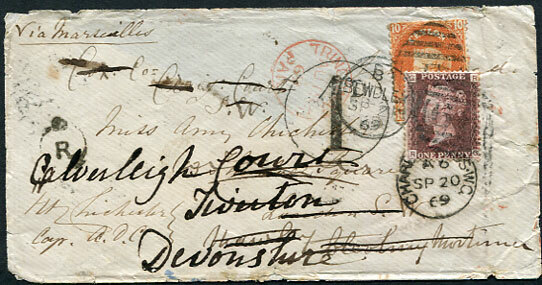 The 10c red bisected on its own (SG.17a, Cat.£600 on cover) paying the 5c local rate is commonly found. The 10c alongside a separate 10c bisect on cover is exceptional (one noted dated DE 1860 paying 5c local rate plus 10c registration from Salisbury to Lower Coverdale SG Auction May/1979 realised £1300). Argenti only recorded three examples of the se-tenant 10c pair, one bisected on entire. 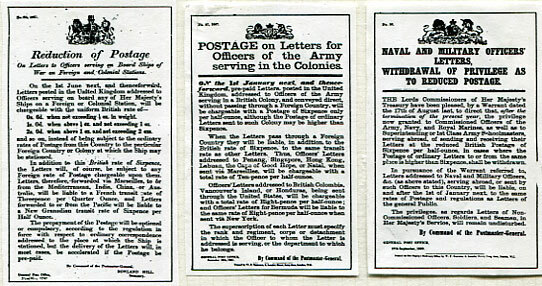 The two other dated covers being FE 14 1861 from W.O. Albert Mines to Hampton paying 5c local, 10c registration (Dale Lichtenstein May/1969 R$525, Sothebys Sept/1984 E£800) and a second triple local rate dated MR 30 1865 from St. John to Kingston, Richibucto marked "with note enclosure" no doubt accounting for the extra weight (ex Argenti, Groom, Chester Beatty). 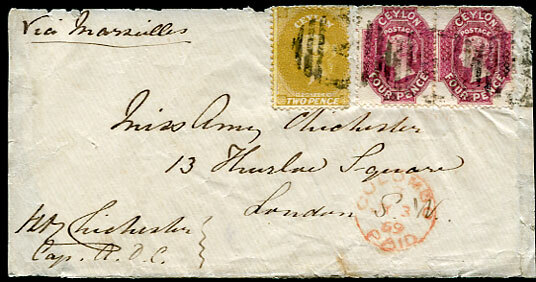 1869 OFFICERS CONCESSION RATE OF 10d cover (1 of 2 known) endorsed "Chichester/Cap. A.D.C." at lower left to his daughter Amy in Cleobury-Mortimer RE-DIRECTED THREE TIMES on arrival with Ceylon QV 10d orange pmk'd black "B" showing red TRICOMALEE PAID AU 18 69 cds alongside and b/stamped red COLOMBO PAID A/AU 21 69. On arrival b/stamped LONDON N7/SP 20 69 and LONDON X10/SP 20 69 with re-direction to a Square in London S.W with circled "1d" due handstamp; further re-direction to Army Agents Cox & Co, Craig Street with free re-direction within London crowned "R" applied plus CHARING CROSS W.C. A6/SP 20 69 cds, finally re-posted with GB QV 1d red Plate 108 pmk'd BEWDLEY SP 21 69 duplex to Tiverton, Devon. Flap removed plus minor faults. 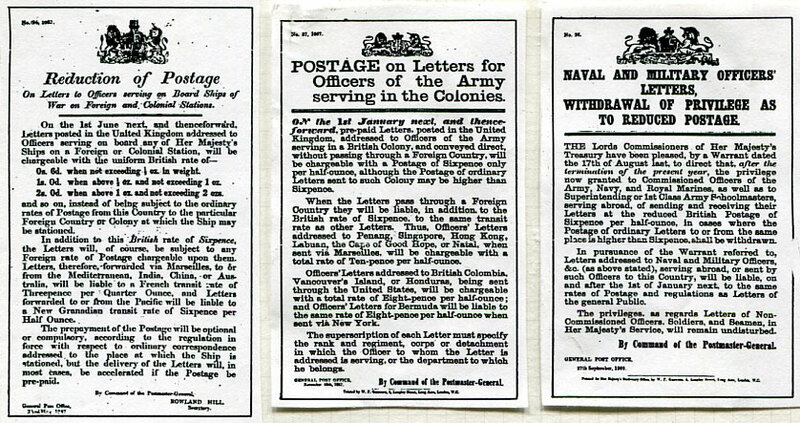 Officers did not mark their mail for the privilege postage rate of 6d per ½oz (plus any Foreign Rate) unless there was a savings. 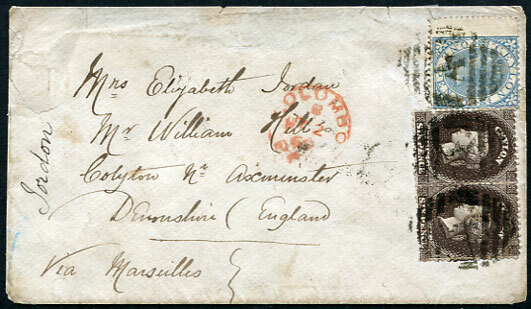 There was no advantage on U.K. mail when rates were 6d via Southampton and 10d via Marseilles, but increases to 9d and 1/1d respectively on FE 1 1868 allowed a savings of 3d (as seen on the above cover). The concessionary rate was withdrawn DE 31 1869 so savings were only possible over a 23 month period. TWO COVERS TRAVELLING ON THE SAME DATE VIA MARSEILLES to ENGLAND, the first with exceptionally rare (1 of only 2 known) OFFICERS CONCESSION RATE of 10d endorsed "Chichester/Cap. A.D.C." to his daughter in London pmk'd COLOMBO B/JY 3 69 backstamped London AU 2 69, the second with standard 1/1d rate to Axminster, Devon pmk'd COLOMBO B/JY 2 69 backstamped Axminster A/AU 3 69, both with missing flaps. An exceptional pairing. 1895 exceptionally rare and perhaps unique side-by-side combination purple Resident Magistrate's Office (R.M. 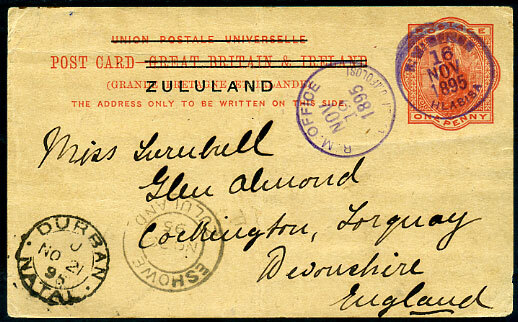 OFFICE) cds for HLABISA 16 NOV 1895 and LOWER UMFOLOSI NOV 19 1895 on GB ovp'd 1d Post Card written by Edith Turnbull at "Bush View 15th Nov. 1895" to Cockington, Torquay with ESHOWE and DURBAN transits. Exhibition item. 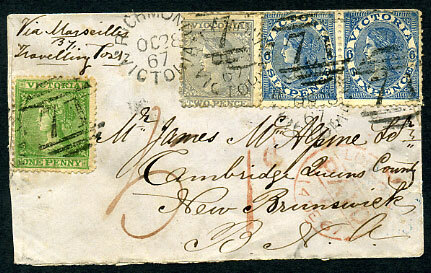 1867 cover to Cambridge, Queens County, New Brunswick marked "via Marseilles by Travelling Post" with QV 1d grass-green, QV 2d lilac-grey, pair QV 6d blue (1/3d rate) tied Richmond OC 28 67 "71" duplex. Melbourne OC 28 67, London DE 14 67, Saint John JA 2 68, Gage-Town JA 4 68 cancels. A rare destination.